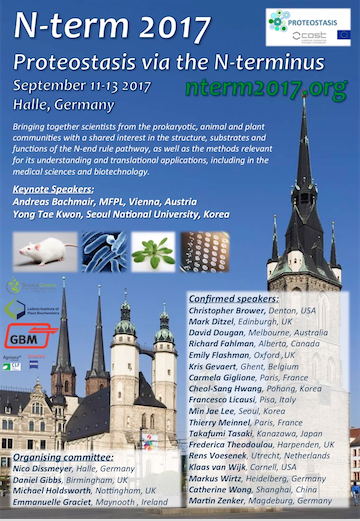 This is a joint meeting of researchers interested in N-terminal posttranslational protein modifications (PTMs), the N-end rule pathway, amino peptidases and endoproteases, and subproteomics. The meeting will involve the participation of PIs, postdoctoral and graduate student levels from laboratories working on model and non-model systems throughout all kingdoms. Such a meeting is novel and would allow networking and discussions without borders. The planned sessions will cover basic research and applications as well as translation to the clinic (depending on the acceptance of invitations to give presentations). The sessions will treat the N-end rule pathway in yeast, animals, plants and bacteria. The meeting is focused on PROTEOSTASIS member’s needs, but it will be opened to the whole scientific community (including researchers outside Europe). At this point, we expect 100 participants and 36 invited speakers. At least 50% will be PROTEOSTASIS participants, including International Partner Countries. Non-participants will be encouraged to join the Action as successfully done previously with co-applicants of grant proposals and publications. Dissemination will be through their websites and the one by the ScienceCampus Halle – Plant-based Bioeconomy. We will approach media for reaching the scientific community and the society in general as done for the five past International Bioeconomy Conferences (http://www.bioeconomy-conference.de) which took place at Halle, Germany. We count on participation of many PROTEOSTASIS members from all the WGs, principally WGs 1 and 6, including the plant field, the methods/proteomics field, and the general PTM field. 1) We want to create a joint platform for discussion, dissemination and networking of plant, animal, and bacterial N-end rule research. This will help to join mainly European researchers in this area. Although several European early-stage groups have initiated novel research lines on plant proteostasis in the last decade, the main research advances have been performed individually. This workshop would be the first one of its kind and it would provide an unequal opportunity to boost research by facilitating expertise exchange and the generation of new collaborations. 2) We want to increase transfer of knowledge from basic to applied science. We will try to select as many contributions as possible which will highlight potential applications in biotechnology (protein production, tuning protein activities), analytics (novel tools for N-terminomics and systems biology), therapy (inhibitory drugs for modulation of protein turn-over via the N-end rule and diseases caused byerroneous N-end rule protein surveillance) and agronomy (stress tolerance mediated by N-end rule, flooding, drought, development, etc.).. 3) We want to highlight technological developments in N-end rule proteolysis. As one outcome of the Plant Proteostasis Workshop in Barcelona, lacking proteomic surveys were flagged. We will specifically invite experts on methodological advances. 4) Currently, the plant N-end rule community is solely located in Europe, while the bacterial and animal communities are spread from KR, US to AU. This workshop will consolidate existing and emerging collaborations and create new ones between European and non-European groups.